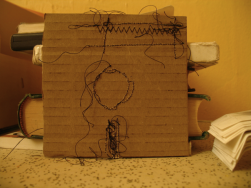 floppy disk in cardboard and thread by rebecca elliott. thanks, becky! when we were small, we heard "the eskimos have over 100 words for snow." later, we were slightly larger and we heard "the inuits have over 1,000 words for snow." damn that is like every noun we know! we imagined communicating in a language made up entirely of snow words. but, as usual, our heart was broken by snarky anthropologists&linguists: The Great Innuit Vocabulary Hoax. it may be a myth that the eskimos have 100 words for snow, but we will not let those word geeks dispute that other timeless and inspirational factoid that we clutch to our chest like a precious trivia marshmallow: the discomos have over 10,000 words for "funky"! pluuuuur connotes a warm feeling supported by dancefloor solidarity in shared desire to get nasty together. fwhhwhwhwhw has a confused energy that can't manage to get started with anything, jacked up as it is by the anticipation of pluuuuur. shagown is a kind of funky that happens when fwhhwhwhwhw builds up too much nervous energy and slingshots past pluuuuur. crunnuk is the quality of funk in the energy coming down from shagown and passing through pluuuuur and back into fwhhwhwhwhw, stopping at each phase to get down, get up, and get it on. lopindle connotes a certain motion of the hips.